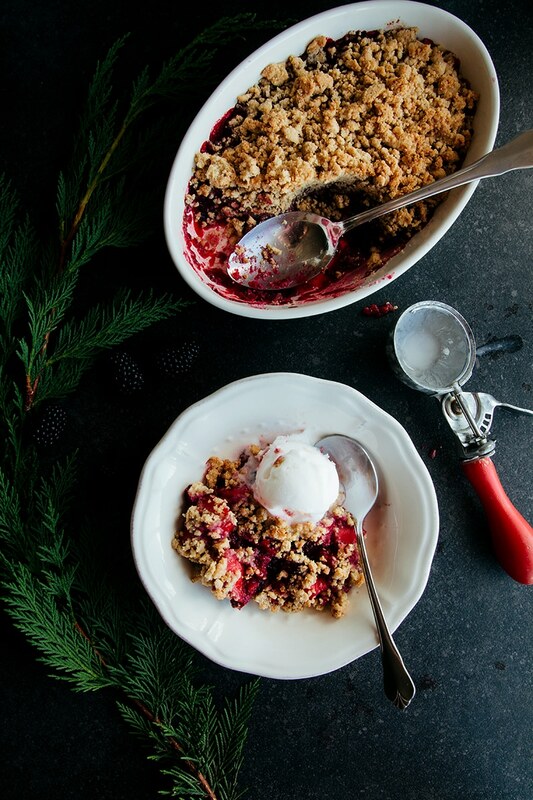 Crumble weather is here! I love this time of year, mainly for the comforting, warming foods that I get the excuse to make. 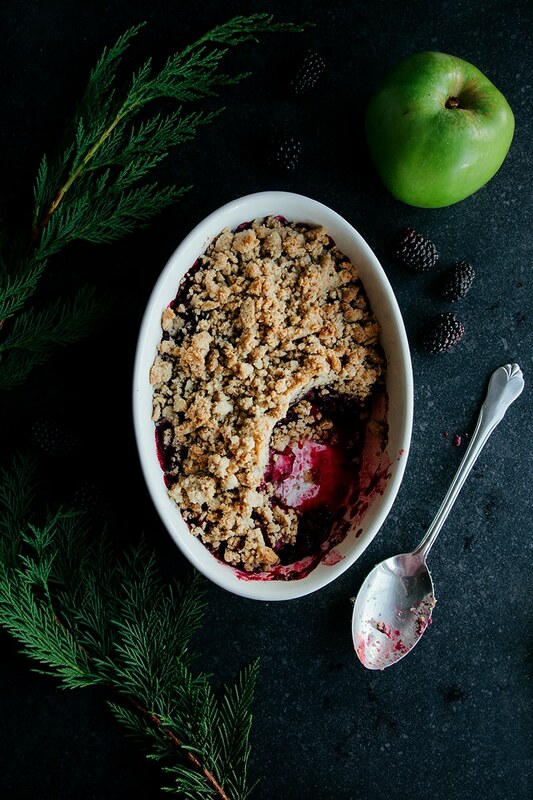 This crumble definitely ticks the comforting and warming boxes. Plus, the flavours are just amazing. 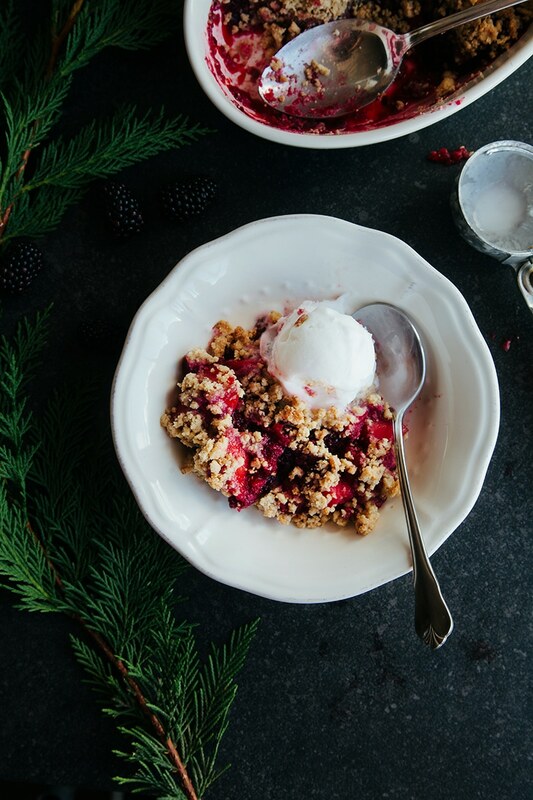 Imagine a classic apple and blackberry crumble with a gingerbread and almond twist. SO GOOD. 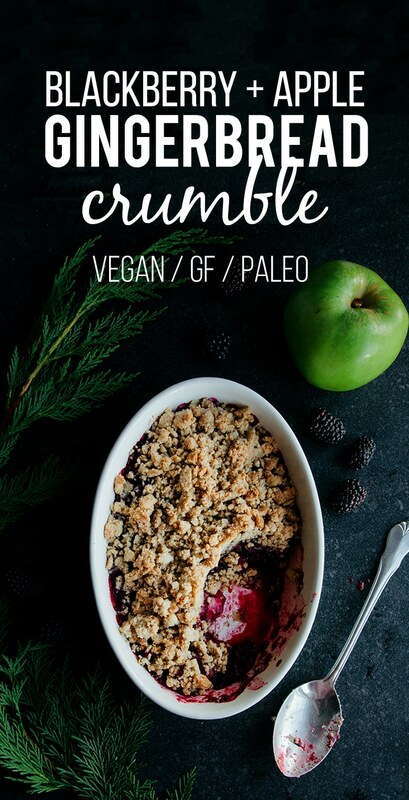 Another thing to love about crumbles is that they’re so easy to make. Minimal, easy prep and a fast baking time means this is perfect for last-minute desserts. 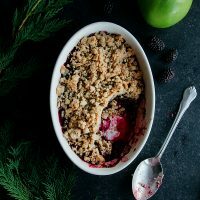 Using ground almonds for the crumble topping not makes this crumble gluten-free & paleo-friendly but also adds another flavour element and works wonderfully with the other ingredients. I served this the night I made it to some friends who had no idea it was “healthy” and absolutely loved it. Especially served with some coconut milk ice cream. A quick easy dessert, full of comforting flavours. 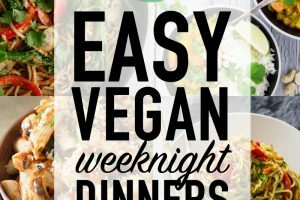 It's dairy-free, gluten-free and healthy too! Add the fruit, coconut sugar and water to a saucepan. Simmer for 5-8 minutes until soft. Meanwhile, make the "crumble" by adding all the crumble ingredients, except the oil and mix together. Add the oil in, a tablespoon at a time, until the mixture begins to clump together. Once the fruit is soft, add to a baking dish and top with the crumble mixture. Bake for 8-10 minutes until the topping is crisp and golden. Serve with a scoop of coconut milk ice cream and enjoy! Hi there! 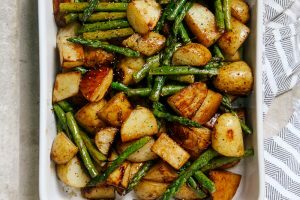 What size baking dish is suitable for this recipe? And what do you think would be a good substitute for the mild olive oil? I was thinking melted butter or coconut oil. All I have is extra virgin olive oil, which has a strong flavor that I don’t think would work in this. AND, last question: when you say ground ginger, you mean spice jar ginger, not ground fresh ginger, right? Thanks so much! 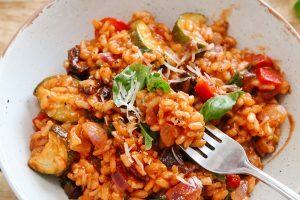 I tried this receipe today! Went yesterday for a walk with my husband, we picked the last of blackberries and we found apple tree and collected big bagful. Looking for simple rcceipe, came across this....perfect. can't wait to try it with ice-cream ! Can I use frozen blackberry? Can the fruits be made ahead of time and freeze? If yes, do I need to defrist before it goes to the oven? 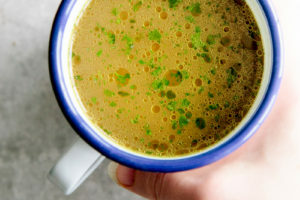 I also made my own pumpkin spice which already has ginger, with the additional finger powder in the recipe, would it be too strong? I'm just wondering.... Thank you! What do you think about subbing the blackberries with cranberries? I think that sounds amazing! You should try that :-) Let me know if you do! do you think that it is possible to use a different flour for the crumble? Coconut flour, maybe? I think you probably could make a crumble with coconut flour but I'm not sure how it would taste with the other flavours, I can't imagine them going that well together, to be honest. You'd have to use a different ratio of flour > fat too. Let me know if you try it though! 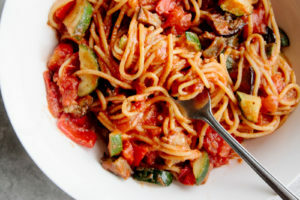 I'm in love with this recipe, Aimee! So simple and healthy yet so beautiful and I'm sure scrumptious. Love your photography, as always. Thank you Nisha, you are so lovely! Thanks Gabriella :-) I agree, they're an amazing combo. It is most definitely crumble weather! I love the change in seasons just so we can transition into warm and cozy foods like this...all the better when it's a sweet. Love your gingerbread twist on this! Love a good crumble on Sunday morning. Apple, blackberry and gingerbread combination sounds superb. Not to mention, this is such a healthy version compared to butter and brown sugar packed crumbles that most people make. 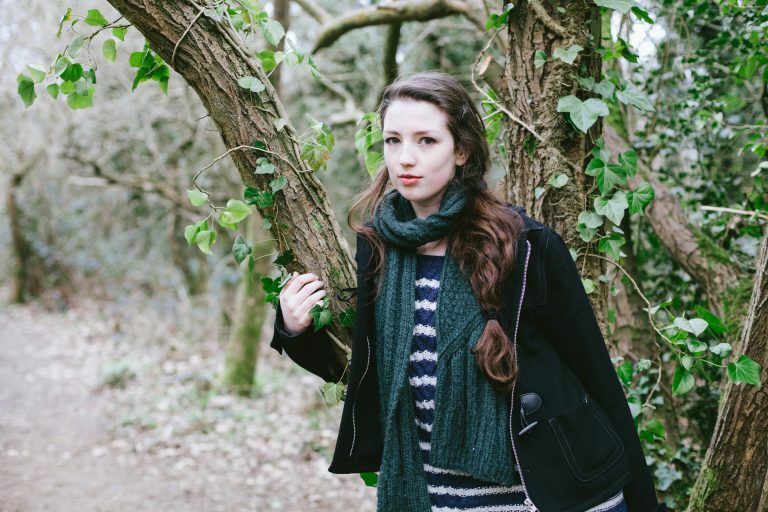 LOVELY photos as always. Hope all is well. Cheers! I may have squealed just a little bit when I saw the word gingerbread in the title!! Even better when you can have gingerbread and ice cream all in one bowl :) And fruit of course. This sounds perfect! I just love apple and gingerbread together! One of the best combinations!